Just when the elder sister Serena Williams boasted of her being in the super fit form, she had to lick her words when Rozzano ousted her from the race for winning the Roland Garros crown she was all set to fight for. 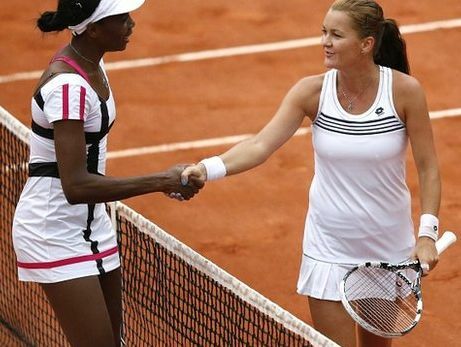 Now the junior Williams Venus also succumbed to third seed Agnieszka Radwanska 6-2 6-3 in round two. With Venus' ouster, both sisters now head home with heavy heart. In other round two matches, World No.1 Victoria Azarenka won over German Dinah Pfizenmaier 6-1 6-1. Also Eighth seed Marion Bartoli served 14 double faults as she surprisingly lost 6-2 3-6 6-3 to Croatia's Petra Martic.